Home > News & Events > LMB News > Nobel Laureate, Sir Aaron Klug, donates his archives to Churchill Archives Centre. 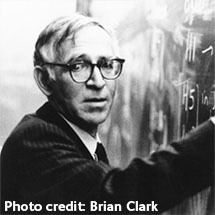 Nobel Laureate, Sir Aaron Klug, donates his archives to Churchill Archives Centre. One of the pioneers of structural molecular biology, Sir Aaron Klug, former Director of the LMB, has given his extensive archive to the Churchill Archives Centre, Cambridge. There it will join the archives of fellow LMB scientists and Nobel Laureates, Max Perutz and César Milstein, and the notebooks of his former colleague, Rosalind Franklin. Aaron’s archive spans the whole of his life and career. From childhood and University in South Africa, to a PhD at the Cavendish Laboratory, Cambridge, to research at Birkbeck College, London and from 1962 at the LMB in Cambridge. Included is material relating to all his scientific research: the study of macromolecular assemblies, most notably viruses, the pioneering development of the technique of 3D imaging in electron microscopy, determination of the crystal structure of tRNA, the structure of chromatin and the discovery of the zinc finger protein fold. Alongside this is material that shows how Aaron has been a major influence on other scientists and on the wider community. A Fellow of Peterhouse, for many years he acted as Director of Studies in Natural Sciences and taught physics to undergraduates. From 1978-1986 he was joint head of the LMB Structural Studies Division. As Director of the LMB from 1986 to 1996, he played a major role in encouraging the successful commercialisation of discoveries made at the LMB and in creating other spin-out activities. From 1995 to 2000 he was President of the Royal Society, the UK’s foremost academy of science. The archive also shows how Aaron has been widely and internationally recognized through many awards, medals and honours, including the 1982 Nobel Prize in Chemistry and the Order of Merit in 1995. In total, about 200 boxes have been placed in Churchill Archives Centre. The archive will initially be closed pending conservation and cataloguing.